Layering is an important aspect of any style of music that relies on programmed drums. The choice of layers, and the way those layers are manipulated, contribute not only to the impact of the drums, but also the sound of the record and the producer’s individual style. 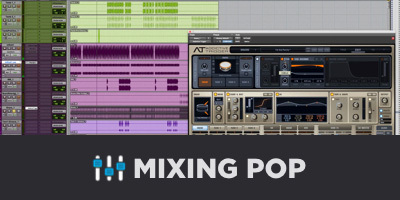 This article provides a jumping off point for creating hybridized drum sounds. If you find the perfect drum for your record … use it. Sometimes there’s no need for additional layers or processing. Don’t force something if it doesn’t need it. Sometimes you find a drum that has a compelling texture or sustain, but lacks punch in the attack. One way to solve this is to find another drum that has the attack power. When layering drums for this purpose, you’ll want to find something that blends together right from the get-go. Now, sometimes pitching the drums can be just what the doctor ordered, but understand that it’s a game of compromises. The other thing to be aware of is the decaying tone of the attack drum. If the decay of the attack drum meshes well with the texture drum — great! If not, look in your sampler and simply alter the envelope of the attack drum to get some of that decay out of the way. Sometimes you find a drum that has a phenomenal sound in a particular frequency range. For example, the top end is really cool or the low end is super powerful. But you may want that drum to have a “bigger” sound — a wider bandwidth of frequency content. Consider grabbing another drum that provides the opposite of what the original drum is giving you. If you have a drum with an excellent treble range, layer it up with something that provides power in the low end, and vice versa. Don’t be afraid to EQ your drum layer here. If you only want the low end from your layer drum, but there’s a weird click or something in there, grab a low pass filter. That doesn’t mean you should always separate your drum layers with filters — that often times results in a “fake” or “thin” sounding composite. But sometimes EQ’ing things around can help the drums lock together and compliment each other well. I believe that’s the main goal when using layers for tonal balance: get the drums to compliment each other. Sometimes you just want to go crazy and mix some stuff up. Necessity is the mother of invention, but creativity is the papa. Grabbing two or three drums and playing with the pitch, envelope, phase, distortion and tone can yield some unique and exciting results. One of my favorite ways to do this is to grab a drum and throw an extreme effect on it. I may bit-crush the snot out of it. Maybe I’ll use a phaser of some sort or a vocoder/talkbox effect. Maybe some extreme EQ. Anything that piques my interest. Then I’ll grab another drum and use it to “anchor” the crazy drum into something more accessible for the genre or song that I’m working on. Phase relationship is of paramount importance when layering drums. If you grab two kick drums, even if they’re completely different, you may find that they have some undesirable interaction on a physical phase-based level. This tends to be more noticeable with lower frequency drums. Yet even higher frequency drums can still interact in this manner. Any time you’re layering drums, do a polarity flip on one of them. What changed? Did the drums become ghostly and hollow? Did the drums suddenly become fuller? Which sounds better? If flipping the polarity makes a dramatic change — particularly with layered kicks — then you’re in good shape. That means you’re either directly in or out of phase and you can adjust the polarity accordingly. However, you may be in trouble if you don’t notice much of a difference. With snare drums, this isn’t as much of a concern. With kicks however, it’s a strong indication that they’re ninety degrees out of phase. What this means is that the micro-timing of the kicks is not in optimal position. You can adjust this by experimenting with tiny timing changes. Delay one kick drum by half a millisecond and see how that changes things. Then try delaying the other. Hopefully you’ll find a sweet spot where they lock together. You might also find plugins like InPhase helpful. The art of layering drums is a bit more complex than it first seems. How you choose to go about it is very personal to your sensibilities. And the potential pitfalls along the way require a developed ear to suss out. Practice and experimentation is the recipe for success. If you have a cool layering technique, let us know in the comments below!